ABU DHABI – A change in subject away from music for the moment: I’ve been reading the novel “The Imperfectionists” over the last few days, my first eBook on my first iPad (mini). I’m behind the times on both the iPad and the eBook. I’ll admit it. I’m not behind the times on computers in general, since my first computer was an Osborne portable, bought in 1982, and everything I have written, thought or imagined since 1982 is contained on a hard disk or two – in addition to the original floppies, other disks, CDs, DVDs and memory sticks since then invented. But as I read this electronic book by a former colleague of mine at the former International Herald Tribune, I began thinking of discussions he and I had before he sold his book about seeking literary agents, and that led me to thinking again about my task this winter, where I’ll be sending out two of my manuscripts, for consideration by agents and publishers (or three manuscripts if you count the French translation of the novel I’ll be sending – (the other book is my open mic memoir)). How Can Publishers and Literary Agents Still Ask for Paper “Manuscript” Submissions? In other words, while they charge 8.99 euros for an electronic copy that costs them nothing to produce (and I don’t want to hear about the editing staff, etc. ), and they expect a reader to be just as happy with reading it in electronic format or printed format, they themselves insist that a poor author pay for printer ink – a fortune – paper to print the manuscript – not a fortune, but it still costs something – and then postage – a fortune?!? 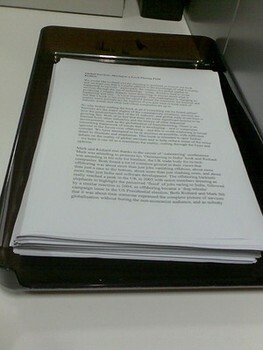 All of which means, the author is probably spending as much or more than 8.99 each time he or she sends out his or her manuscript to a publisher or agent, who will not look at it otherwise, but who, if they like it, will then charge readers the same amount to read it, and take the lion’s share of the profits. I don’t get it. The newspaper industry long, long ago modernized to the point where an electronic story submission is the only kind they really want. 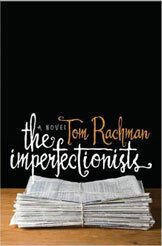 (There is a passage in “The Imperfectionists” about an old freelance journalist who is stuck in his ways, and poor, (because he gets no more work) who still faxes his stories to the newspaper, causing a huge headache to the staff each time they have to re-type it into the system.) And yet so much of the publishing industry, that battles to keep its corner of the electronic market and rights, still refuses the electronic submission of what will eventually come out as an electronic product. I really would like to have an explanation on this strange, dinosaur leftover from another era. Part of me thinks that because the industry is more bombarded than ever before with manuscripts from potential authors, and because it is easier than ever for authors to make submissions of unpolished or hair-brained books, the editors and agents seek a kind of natural selection process on the basis that the more serious writers will take the time to print out and mail a manuscript, rather than shoot one off on a whim via email. If that is the case, I don't buy it. A great manuscript will rise to the surface of the slush pile eventually, whether it be electronic or printed out, and the crappy electronic submission is a lot easier and less time consuming and polluting to deal with than the crappy printed manuscript. And the excuse that an editor or agent would really like to sit down in a chair and read a paper version of the novel rather than read an electronic version is really no longer valid, is it? When they are selling us "air" for 8.99 euros or much more…. By the way, it was taking me forever to get around to going to a bookstore to buy a paper copy of Rachman’s novel (or any other English book in Paris), which I had been hearing about for so long from friends and strangers. And I had no real excuse (except Paris), especially since I felt it practically an obligation for me to read a former colleague’s novel, especially one all about the newspaper world, the expat newspaper world that we both worked in. So it was with my new iPad mini in hand that I decided to rectify that situation, and I’m just loving the book! Rachman has a real way with language, and the characters and situations are extremely memorable. The stories really flow. It is written with a simplicity that is hard to achieve. (As I think Pete Seeger once said, perhaps comparing Dylan and Hank Williams: “Anyone can be complicated, it takes a genius to be simple.” (Although Dylan is a complicated genius in my opinion, and in the opinion of most.)) Of course, I’m not finished the book yet, so perhaps I’ll lose interest…but I doubt it. And if I do, well, it only cost 8.99 after all, and I won’t have to put it on my shelf to collect dust. Of course, I might have to eliminate it from many more places, as it has been migrating from my iPad to my iPhone and maybe soon to my MacBook Pro, if they let me…. Enough rambling rant! If anyone has an answer to my question about how publishers and agents can be committed to electronic books but not electronic submissions, please let me know! La Javanaise at the Ptit Bonheur – oh La Chance! Last night was Ollie’s open mic at the Ptit Bonheur la Chance bar near the Pantheon, and I had good evening. But it was really punctuated by the song sung by Thomas Stock, an up-and-coming Paris musician with a killer voice at age only something like 22 (not sure exactly). I mention the age because what was so cool last night was Thomas’s choice of opening song in his moment behind the mic in the cave of this nice little bar on the rue Laplace: It was one of the rare times I have heard anyone in the open mic scene in Paris do a song by Serge Gainsbourg. Why don’t they do it more often? Instead of yet another Anglo-Saxon pop hit from the same period. In any case, Thomas chose “La Javanaise,” and did a great job. At the end of the evening a Spanish woman asked if she could play, and it turned out to be her first ever appearance in front of an open mic audience playing guitar and singing. But when she got behind the mic she realized that she had to read her lyrics and chords and that she could not see in the dark. This is a very cosy open mic, but the darkness means that with my Zoom Q3 we never see anything. I wanted to hear the woman, so I proposed that I stand over her shoulder and beam down my iPhone in its flashlight mode, an application which turns the iPhone into a flashlight, and which I had downloaded in Sao Paulo so I could read Mojo in the darkness in the traffic jams. I did not realize until today when I went to upload the Thomas Stock video that Ollie Fury, the organizer and MC of the open mic, had grabbed my Zoom recorder and videoed a bit of me holding the light, and the woman singing. I have included it here primarily because for the first time – why did I not think of it – you can catch a larger glimpse of the room in which this open mic takes place. By the way, it was quite full earlier on, but by the end there were just a few of us left, as you will see in the video.